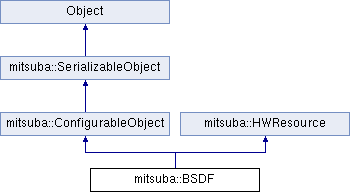 This class implements an abstract interface to all BSDF plugins in Mitsuba. It exposes functions for evaluating and sampling the model, and it allows querying the probability density of the sampling method. Smooth two-dimensional density functions, as well as degenerate one-dimensional and discrete densities are all handled within the same framework. For improved flexibility with respect to the various rendering algorithms, this class can sample and evaluate a complete BSDF, but it also allows to pick and choose individual components of multi-lobed BSDFs based on their properties and component indices. This selection is specified using a special record that is provided along with every query. This list of flags is used to classify the different types of lobes that are implemented in a BSDF instance. They are also useful for picking out individual components by setting combinations in BSDFSamplingRecord::typeMask. Reflection into a discrete set of directions. Transmission into a discrete set of directions. Reflection into a 1D space of directions. Transmission into a 1D space of directions. The BSDF depends on the UV coordinates. Supports interactions on the front-facing side. Supports interactions on the back-facing side. Uses extra random numbers from the supplied sampler instance. Convenient combinations of flags from EBSDFType. Diffuse scattering into a 2D set of directions. Non-diffuse scattering into a 2D set of directions. Scattering into a 2D set of directions. Scattering into a discrete set of directions. Scattering into a 1D space of directions. Create a new BSDF instance. Convenience function to ensure energy conservation. This function determines the component-wise maximum of the texture tex and checks if it is below max. If yes, it returns the texture unmodified. Otherwise, it wraps the texture into a ScaleTexture instance (with a scaling factor chosen so that the desired maximum max is abided) and prints a warning. This function determines the component-wise maximum of the sum tex1 + tex2 and checks if it is below max. If yes, it returns the texture unmodified. Otherwise, it wraps each the texture into a ScaleTexture instance (with a scaling factor chosen so that the desired maximum max is abided) and prints a warning. This method allows to query the BSDF as a whole or pick out individual components. When querying a smooth (i.e. non-degenerate) component, it already multiplies the result by the cosine foreshortening factor with respect to the outgoing direction. measure Specifies the measure of the component. This is necessary to handle BSDFs, whose components live on spaces with different measures. (E.g. a diffuse material with an ideally smooth dielectric coating). Return the number of components of this BSDF. For transmissive BSDFs: return the material's relative index of refraction. The default implementation returns 1.0. Sometimes, BSDF models make use of a perturbed frame for internal shading computations (e.g. bump maps). This function exposes this internal frame. Sometimes, BSDF models make use of a perturbed frame for internal shading computations (e.g. bump maps). This function computes the derivative of this frame with respect to the UV parameterization of the underlying shape. Return the measure corresponding to a particular component type. For rough BSDFs: return the root mean square surface roughness of the given BSDF component. Return a listing of this BSDF's component types and properties, combined using binary OR. Test whether this BSDF contains a certain type of component. Compute the probability of sampling bRec.wo (given bRec.wi). This method provides access to the probability density that would result when supplying the same BSDF query record to the sample() method. It correctly handles changes in probability when only a subset of the components is chosen for sampling (this can be done using the BSDFSamplingRecord::component and BSDFSamplingRecord::typeMask fields). Sample the BSDF and return the importance weight (i.e. the value of the BSDF divided by the probability density of the sample). If a component mask or a specific component index is specified, the sample is drawn from the matching component, if it exists. Depending on the provided transport type, either the BSDF or its adjoint version is used. The BSDF value divided by the probability density of the sample sample (multiplied by the cosine foreshortening factor when a non-delta component is sampled) A zero spectrum means that sampling failed. This function is not exposed by the Python API. See the other sample function instead. When sampling a continuous/non-delta component, this method also multiplies by the cosine foreshorening factor with respect to the sampled direction. The BSDF value (multiplied by the cosine foreshortening factor when a non-delta component is sampled). A zero spectrum means that sampling failed. Return whether this BSDF makes use of ray differentials.